Disappointed Madilyn Paige and Maddy Hudson didn't make the top 24 as well as a few others including a very close local for me but it's great to see Emily Brooke in there. The post was edited 2 times, last by Ryan ( Jan 4th 2016, 10:33pm ). At first glance its another mediocre season talent wise much like the last 3 seasons but maybe someone will surprise me. I guess I will be following the final season of Idol since I watched that show since the start. 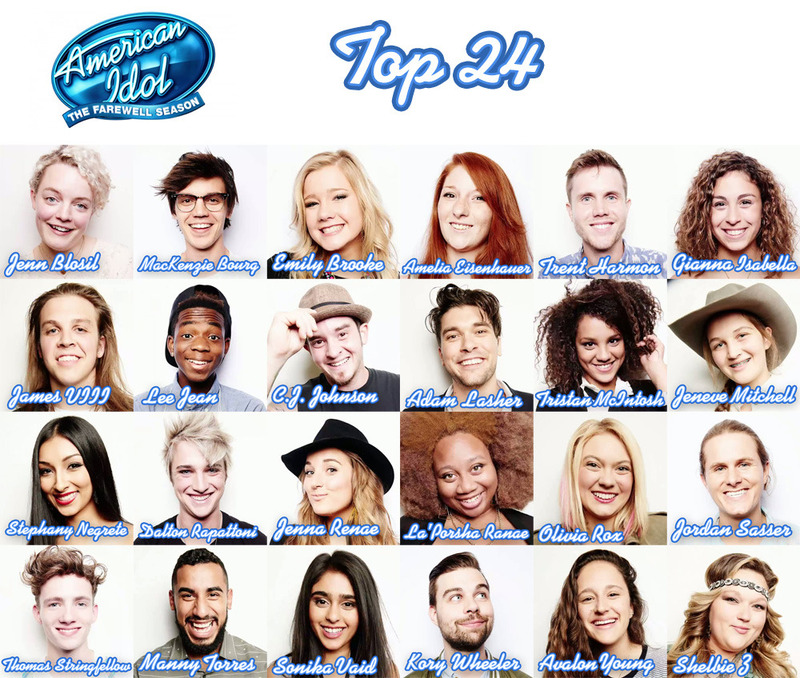 I find a couple of girls in that Top 24 who are interesting -- I like their tone at least: Olivia Rox and Tristan McIntosh. Hopefully they'll make the top 12 so I have a couple of contestants to root for. Maybe I'll find more favorites as the season progresses. Which is a shame because auditions have been pretty good..but it doesn't seem like many of the unique ones made it. Of the guys, I'm only remotely interested in Lee and Adam. And only out of curiosity. The girls...a few have potential..but looks like they eliminated some pretty good ones. Yeah all my eggs are in the Sonika basket right now but I missed last nights episode so I don't know who else of the T24 got shown. Which is a shame because auditions have been pretty good..but it doesn't seem like many of the unique ones made it.Of the guys, I'm only remotely interested in Lee and Adam. And only out of curiosity. I liked all of them a lot except La'Porsha but a lot of people liked her and rated her high. She was just too much for me. If not its certainly close. Mercifully some actual talent from Pre S12 will save tomorrow night. Harry - 'That was tremendous"
J Lo - "you play with your voice in a way I've never really heard before "
^That's the actual results? Was the whole thing taped a while back? I barely paid attention so I only remembered the harp girl, the girl who sang IPASOY and the one who sang Safe and Sound. The rest were blah to trainwreck. EDIT: I also remembered the girl who sang Cassadee's song because it wasn't good (her version, the song is fine). Thomas' cousin (Danielle Bradbery) needs to give him some vocal lessons because he's terrible. I haven't watched the show since season 7 (I'll watch youtube clips if people are talking about a contestant or I already followed them on twitter), but between the boring and delusional panel and the lack of overall talent, I can't watch the show. Thats DB's cousin? Well we know where all the talent went in that family, he could definitely use her help. Yep, Danielle actually has a cousin that's more talented than Thomas in Jenny Barosh. I don't think Jenny is great like Danielle but she does have talent unlike Thomas. Don't know how Thomas got in the competition. He's not good and could definitely use his cousin's help. Knowing Idol fans, he'll win. But I can't honestly believe that they are related. I like Avalon. And Jenn has amused me more than any contestant that's been on the show (#TeamStoner), so I'm all about her. Yeah I agree about those two. I also like Sonika's voice even though she's boring. Yea, she's got some Thia Megia in her, except she's not competing against one of the most talented field of idols. Instead she's one of the best singers there.